Whether you wish to join the MassMu story as an individual, family, or business, there are various levels at which you can sign up to show your support. A link to MassMu’s Corporate Membership Brochure can be found below. 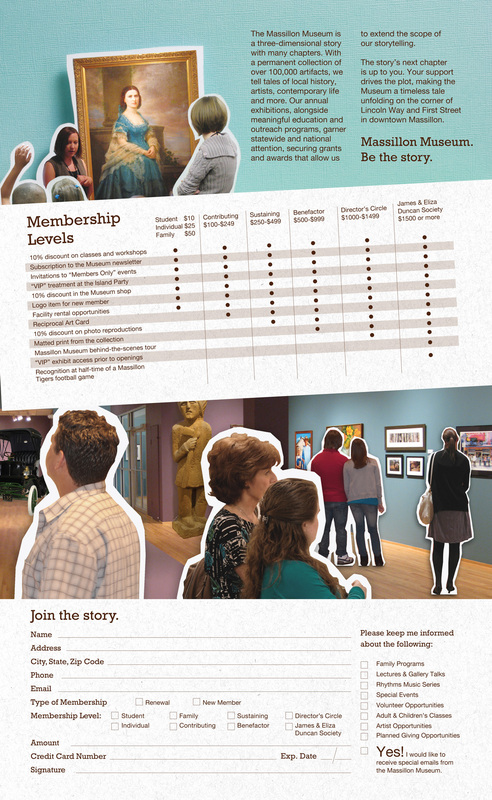 Membership benefits you, your Museum and your community! Membership provides vital operating funds that preserve the Museum’s collection, create educational programming, and develop quality exhibitions. Through membership, you are making an investment in your community and heritage. Click here to read about our MassMu Points of Pride! Click here to sign up online for membership! Click here to download our Massillon Museum Membership Brochure. Learn more about our Pet Membership program! Along with the above mentioned benefits, you will also receive a Reciprocal Art Card at this level. Along with the above mentioned benefits, you will also receive a 10% discount on photo reproductions at this level. Along with the above mentioned benefits, you will also receive a matted print from the collection (new print every year) at this level. Along with the above mentioned benefits, you will also receive a behind the scenes tour of the museum at this level. Along with the above mentioned benefits, enjoy "VIP" exhibit access prior to openings, and receive recognition at half-time of a Massillon Tigers football game at this level. Download the Corporate Membership brochure for full details on the benefits for you and your employees. Click here to sign up for a Corporate Membership online. Please email Scot Phillips, Operations Officer or call 330-833-4061 x110 if you would like to purchase a membership. We accept Visa, Mastercard, check and cash. Garner Insurance and Financial Services, Inc.
Krugliak, Wilkins, Griffiths, & Dougherty Co.
RT Hampton Plumbing & Heating, Inc.
John Patrick Picard Architect, Inc.
D & A Plumbing & Heating, Inc.
J Douglas Paulus DDS, Inc.